I notice the ROM Revision MacVidCards. I’m assuming the Titan Card require a flashed ROM if used in an Original Mac Pro that’s year less than the 2013 model . So if the Titan X card is used in a Hackintosh it would not require a flashed ROM ? As a long-time follower, and more recently a NVIDIAn, thanks for the shout-out to “friends in California”! While OS X on generic x86 advances make for an incredible spectator sport, a game of cat and mouse, I’m also delighted that MacPro3,1 can still house a TITAN. Long live Deep Neural Nets (and GTA V). So far finding the Nvidia GTX980 4GB and the TITAN X 12GB have really terrible OpenCL implementation. Weirdly LuxMark 2.1 shows a good score (v3 doesn,t work properly) but neither GPU will playback RED in FCPX or Premier Pro CC 2014 under OpenCL. CUDA works great but Mac Pro Apps really need OpenCL. 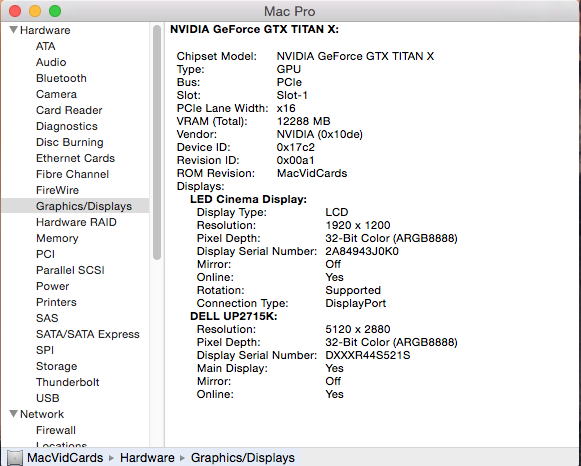 I have a Titan X (with original BIOS, not EFI) running on OS X 10.10.3 with the latest Webdrivers from NVIDIA on my “HackPro5,1” (i7 980 still on a good-old-X58 chipset). Everything works well except one small point that starts bothering me a bit: I see here and there some scrambled images inside Safari. This also happens inside Preview if I export the website as PDF. …however, looking to the same PDF using Acrobat Reader works. Has anyone seen similar behavior ?